Italians are a Mediterranean national and ethnic group that share a common Italian culture, ancestry and language. Within Italy, Italians are defined by citizenship, regardless of ancestry or country of residence, and are distinguished from people of Italian descent and, historically, from ethnic Italians living in the territories adjacent to the Italian Peninsula. In 2014, in addition to the more than 55 million Italians in Italy and 32,000 in San Marino, Italian-speaking, autochthonous groups are found in neighbouring countries: about 500,000 in Switzerland, a large, but undefined population in France (Nice, Corsica), and smaller groups in Slovenia and Croatia, primarily in Istria. If regarded as an ethnic group, Italians would constitute one of the world’s largest. Because of wide-ranging and long-lasting diaspora, about 5 million Italian citizens and nearly 80 million people of full or part Italian ancestry live outside of Italy, most notably in South America, North America, Australia and parts of Europe. There are seven data sets that have been incorporated into DNA Consultants’ method. The Italian population data represent DNA samples from 223 unrelated Caucasian individuals from Italy. Samples were obtained by the Servizio Carabinieri Investigazioni Scientifiche (Scientific Investigation Service of the Italian military’s civilian police force); and by the Program Manager for DNA Research in the Forensic Science Research and Training Center at the Federal Bureau of Investigation (FBI) Academy in Quantico, Va. The Italian – Tuscany population data represent DNA samples from 188 unrelated individuals from the areas of Florence, Prato, and Pistoia (Tuscany, Central Italy) in 2001 by the University of Florence- Azienda. The Italian – Piedmont population data represent 147 unrelated Italians residing in Piedmont (Northwest Italy) who were sampled in 2004 by the University of Turin, Italy. The Italian population data represent 1,541 Italian individuals from 12 regions of Italy, who were sampled in 2006 by twenty laboratories scattered around Italy (sixteen hospital/universities, three private companies, and one national criminal justice service). The Italian population data represent DNA samples from 209 randomly selected, unrelated individuals from 19 different regions of Italy. The Italian population data represented by DNA samples from 120 randomly selected, unrelated individuals from Western Sicily. The Italian population data represented by DNA samples from 103 randomly selected individuals from Italy. STR frequencies were reported in the most recent European database release of the Working Group of the European Network of Forensic Institutes STRbase Project (Frequencies). 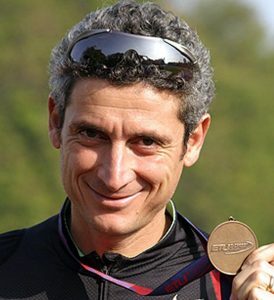 Photo: Photo is of Alessandro Lambruschini, an Italian long distance runner. Photo by Luigi Esposito.